I apologize. That is a terrible image. The light was low, and I couldn’t see what I was doing. But the historic moment needed to be captured. That there, amici, is a dozen Massachusetts oysters. Local ones. A friend invited me to dine with him tonight at the Oceanaire Seafood Room, where I asked our waiter, a self-described “oyster nerd,” to deliver me a good tasting of the local fare. He brought me four each of the bivalves from Katama Bay, Pleasant Bay, and Island Creek. This side of Paris, it’s as as close as I’m ever going to get to the happiest place on earth (I speak, of course, of Huîtrerie Régis). These oysters were transporting. They’re briny, minerally, metallic — just everything you could possibly want in an oyster. The Island Creeks were my favorite, because they had a hint of melony sweetness in the middle, just like the Marennes-Olerons chez Régis. Mark my words: I am going to have every possible meal at a Boston oyster bar while I’m here. If an oyster bar opens for breakfast, I’m there. I could not imagine living in a place where you could just walk in off the street like you were the Tsar of Russia or something, and purchase such goodness, and slurp it right off the shell. “Where are you from?” said the waiter, amused by my enthusiasm. “The wahm watah,” he said. “S’no good.” And then he discoursed on oyster terroir. I was in heaven. Am in heaven. You know where to find me for the next couple of days: either at the Q Ideas conference, at BC talking about Dante, or communing at an area oyster bar with all that is good and holy in the great state of Massachusetts. UPDATE: I didn’t mention that I found a fantastic used book store, Commonwealth Books, just down the street. Bought a copy of Esolen’s translation of Dante’s Paradiso for $6, and The Dissolution of the Medieval Outlook by Gordon Leff for $11. And if I hadn’t had to run out to make my dinner engagement, heaven knows what else I would have carried out of that store. Posted in View From Your Table. Tagged Massachusetts, Boston, oysters. Some years ago, friends of mine lost a box of books to a roof leak. The husband was particularly broken up about the ruin of a large history book called The Viking, the only one in the box that was out of print. I looked at that poor thing, so swollen it wouldn’t come out of its slipcase, and thought “I can find that secondhand.” In those pre-Web days, Boston was even better endowed with used bookstores than it is now. I spend a whole weekend searching. I had an intuitive notion that Commonwealth Books on Summer would be the place, but a thorough perusal of its history section turned up nothing. Happily I expressed my frustration to a clerk and he found it — in the maritime section. And the look on my friend’s face when he pulled it out of wrapping paper the following Yule made it worthwhile. I hope that you had the opportunity to wash down the oysters with Spencer Abbey Trappist Ale. Oysters and Trappist ale: a superb pairing. This ale is brewed in Spencer MA and is the only Trappist ale produced in the US. It is brewed in a totally modern facility that has adopted environmental, agricultural, and energy sustainable practices. Aside from its wonderful taste, sales of the ale support the life of contemplative monks, an added bonus in my book (and yours). So… you’re going to wander off campus from BC and check out the New England Mobile Book Fair on Needham Street in Newton, right? Their books are not used, but they have a wicked remainders section, and everything else is seriously discounted. And, no offense, but your transliteration of a Bahsten accent is probably about the same as my transliteration of a Louisiana drawl. Nice try. Hope to hear you Thursday night. Everything about this post is delightful. While you are so busy wriggling like a cat in cream: if you like to eat crab, I heartily recommend the crab pretty much anywhere in New England. Ah, oyster bars. They’re everywhere in Massachusetts. When I lived in Boston, my friends and I would take advantage of frequent $1 an oyster specials and gorge on dozens of briny goodness at a time. Washed down with a local ale or an oyster shot. Yes, great used bookshops are thick on the ground there. When I left Boston, I had about a thousand books in my collection… Then there are the bookshop-cafes, like the Trident on Newbury St in Back Bay. I used to walk over after mass and while away the day at that wonderful place. Open till midnight seven nights a week too. A few years ago, I was poking around an old bookshop in Plymouth (about 45 min south of Boston) and came across a huge, heavy old family Bible. It turned out to be a Haydock Bible (I had wanted to get a Bible with the Haydock commentary but balked at the $140 price tag for a modern printing). This was $94. Why not? I got it and dragged it all the way home to Boston. It was then I found out that it is the exact same edition and printing as the 1850 Kennedy family Bible (now on display at the JFK Library). A similar copy recently sold for $1600 on eBay. Stuck inside was a holy card commemorating the 25th anniversary of the coronation of the reigning Pope Pius IX. You never know what you’ll find. If Island Creeks were your favorite, you’ll have to go to the Island Creek Oyster Bar in Kenmore Square, owned by the Duxbury oysterman himself. Then there is the Oyster Happy Hour. Puritanical Massachusetts laws don’t allow discounted alcohol, so many bars in the Commonwealth replace the 2-for-1 drinks specials with $1 oysters. It’s a thing. Are you renting a car and driving or taking cabs? If it’s the former I hope you have a GPS or you’ll inevitably end up in a “can’t get there from here” situation. I wish I was kidding, but the roads here were laid out by cows, who were probably drunk. Mind you, oysters are not only cultivated here in the Bay State. The Ocean State has some mighty fine ones, too. Yes, Island Creek! Legal Seafood’s fried oysters are also excellent. PS: I wish I could attend this evening, but I cannot. PPS: Now that you’ve been in the heart of Boston’s downtown (Spring Lane – where the bookshop is), imagine what it was like here 2 months ago when we’d had >90 inches of snow in three weeks with no melting, with tiny pathways between walls of snow in that very very tight downtown…. While there is considerable charm in certain physical details of our fair city, understand now why Bostonians are not notorious for being charming, but perhaps cranky. Cranky works for us. But we are also neighborly in practical ways, and, well, I’d say resilient but for the over-use of that word after the events of Patriots Day 2013. Our environment builds our character, for ill and for good. And for a real treat, some to the Puget Sound and get some wild harvested Olympia oysters. They truly are the creme de la creme of the oyster world. They’re pricey, but for an oyster connoisseur they worth it. While there is considerable charm in certain physical details of our fair city, understand now why Bostonians are not notorious for being charming, but perhaps cranky. I think that’s part of their charm! Witness Rod’s waiter last night—if anything, New Englanders are real. They don’t pretend. They are authentic. They are candid and frank… even when they’re sober. It’s refreshing. I made such great friends there. Boy you’re right about the Financial District and Downtown Crossing areas. It doesn’t look that old (save the Old State House) because almost all of it burned down in the Great Fire of 1872. But it was rebuilt on the same ancient spaghetti street pattern of twisting cowpaths, and wintertime is rough there because of the aforementioned snowbanks as well as the howling wind that blows between those tightly-packed skyscrapers. Rod, I’m sure you appreciate how walkable Boston still is compared to nearly all other American cities. It didn’t happen by accident—postwar Boston’s city fathers were just as enthusiastic about ruining suburbanizing the city as elsewhere, but the wrecking ball was finally halted by protests before all was destroyed. Imagine a big green elevated expressway winding right around the area where you are staying, cutting off the North End and the waterfront from the rest of the city. Between the 1950s and 2004, that’s exactly what was there before they spent £16 billion burying I-93 and turning the land into the Rose Kennedy Greenway. The Masspike (I-90) was also rammed through the city around this time. (the Oceanarium is in that tall building in the back). It was a hopping, vibrant (if a bit seedy) entertainment district. But you know? Something stopped all this “progress”. In the later 1960s, they were ramming yet another highway (I-95) through Boston and Cambridge. Home demolitions were proceeding northward and had reached Roxbury when protests forced the project to cease. In 1970, the farsighted governor of Massachusetts declared a moratorium on all new highway construction within the 128 corridor (basically Greater Boston) that still stands. 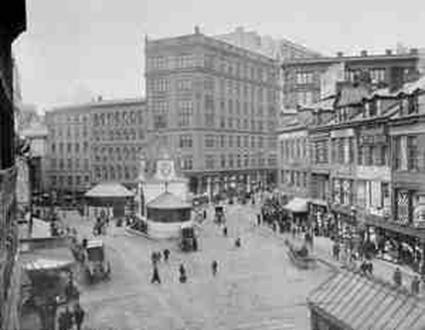 Instead the Commonwealth plowed money into upgrading the MBTA transit system and supporting the preservation of Boston’s urban landscape beginning with the pioneering renovation of Quincy Market in 1976. They even cleaned up the Charles River and Boston Harbor. A city that was on its way to becoming yet another rust-belt post-urban failure has become such an attractive place to live that there isn’t enough housing to go around. The Detroits and Clevelands of America were not inevitable—they were made that way by disastrous political and business decisions. Oh, I agree. My parents and extended families are from New England. I went to college in Virginia, and some very close friends from the South migrated to Greater Boston during their adult years. Boston was an adjustment in expectations. Bostonians tend to be cranky, in the way bee hives get cranky – it’s a form of fierce community spirit. It’s that crankiness that begat the War of Independence. And lots of other things. Like preventing Boston from being bulldozed. And, perhaps, preventing us from being stuck with the madness that is the 2024 Olympics. It has given us a very high quality of life that people protect fiercely. When New Yorkers condescend to note our provincialism, sensible Bostonians are inclined to think, “if you don’t care enough about your own town to be passionate about it, it’s your loss”; besides, New Yorkers in The Boroughs can be just as provincial – and that’s a compliment/salute to them. 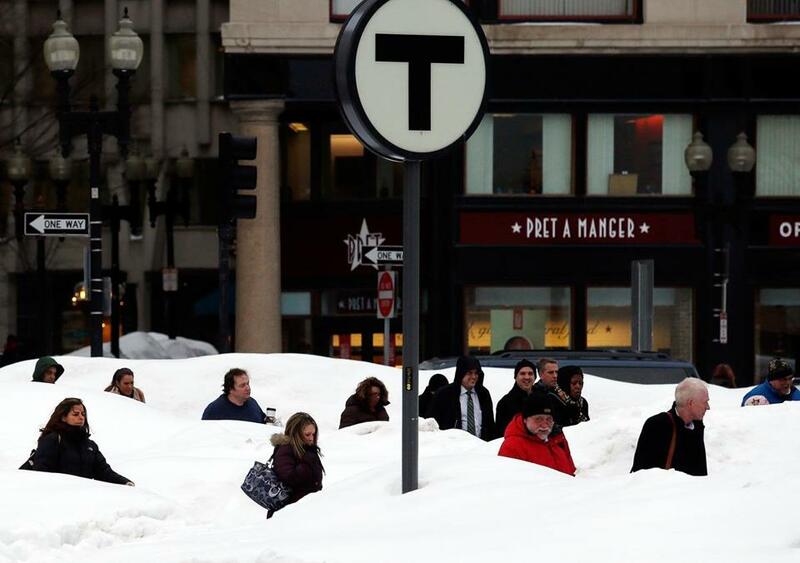 (Where New Yorkers may prefer to exact hot revenge, Bostonians tend to prefer ours served cold and well considered – that’s a temperamental difference between the rival metros. It’s one reason Bostonians are not uniformly frothing at the mouth to deal D. Tsarnaev the death penalty; in the Yankee accounting book of many, that’s too easy.) Boston is a great city with the soul of an English town. When the bombings happened here 2 years ago last week, most everyone was within a single handful (often only 1-2) of degrees of separation from runners on site, victims or first responders of some kind; and that’s one important but often-neglected explanation for how we behaved the way we did (and still do). Good grief. It looks like the oysters at the Oceanaire are 4 dollars each! 48 dollars a dozen. I can get a dozen gulf oysters at my local joint for 9 bucks, shucked on ice, and they seem pretty good to me. Maybe the Atlantic oysters are worth 4 times the cost; they better be. Last night at about the same time Rod was eating these oysters, I was eating Marxachusetts ersters at 32 in the IP Biloxi. Awesome. I’m sorry, but Grendel is simply wrong. Wrong. Wrong. Wrong. I am a Bay Stater transplanted to the Golden State. The Pacific oyster is a sad creature, a pale imitation of their North Atlantic cousins. Speak to me not of Kumamoto oysters. I am particularly partial to oysters from Prince Edward Island, but my greatest pleasures in oyster eating have always been some Wellfleet oysters preferably consumed in Wellfleet, though Truro or Provincetown will do in a pinch (though why I wouldn’t be able to get to Wellfleet from either of, I’m not sure). It’s only a two hour drive from Boston, Rod (longer if the Sagamore bridge gets backed up). Wellfleet Drive-in which is a fun family activity. Although I used to go there in my 20’s even before I had kids.